Last night was the first time I was able to spot Comet Lovejoy with unaided eyes. The latest images from our readers and dedicated astrophotographers confirm that now is a good time to see the comet, which is reaching maximum brightness at his week. Spaceweather.com reports that many experienced observers say the comet is now shining at magnitude +3.8. With clear, dark skies C/2104 Q2 is easily seen with binoculars. Enjoy this gallery of recent images, and if you’ve taken an image, consider joining our Flickr pool and submitting it. We may use your image in an upcoming article! Comet Lovejoy C/2104 Q2 cruising past the open star Cluster M45 “Pleiades” or “The Seven Sisters.” Credit and copyright: John Chumack. Comet Lovejoy taken on January 15, 2015 from Singapore. Credit and copyright: Justin Ng. 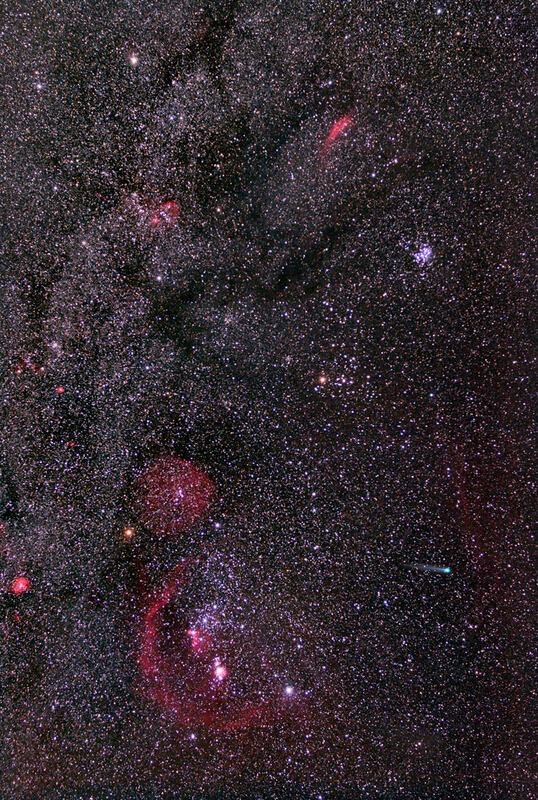 Comet C/2014 Q2 Lovejoy in a widefield false color image taken on January 16, 2015 from New Mexico Skies. Credit and copyright Joseph Brimacombe. Comet Lovejoy, C/2014 Q2, a wide binocular field west of M45, the Pleiades star cluster in Taurus, on January 15, 2015, shot from Silver City, New Mexico. The long blue ion tail stretched back for about 8°. Credit and copyright: Alan Dyer. Comet Lovejoy photographed from Torrance Barrens Dark-Sky Preserve (30 km from Gravenhurst, Ontario, Canada; 200 km north of Toronto) on January 13, 2015. Credit and copyright: Michael Watson. High resolution 3 panel mosaic of C/2014 Q2 on January 11, 2015. Field of view is approximately 3.5° x 2° and composed of three fields. Many fine streamers are visible emanating from the nucleus. Credit and copyright: SEN/ Damian Peach. Comet LoveJoy photographed from Kosovo on January 13, 2015. Credit and copyright: Suhel A. Ahmeti. 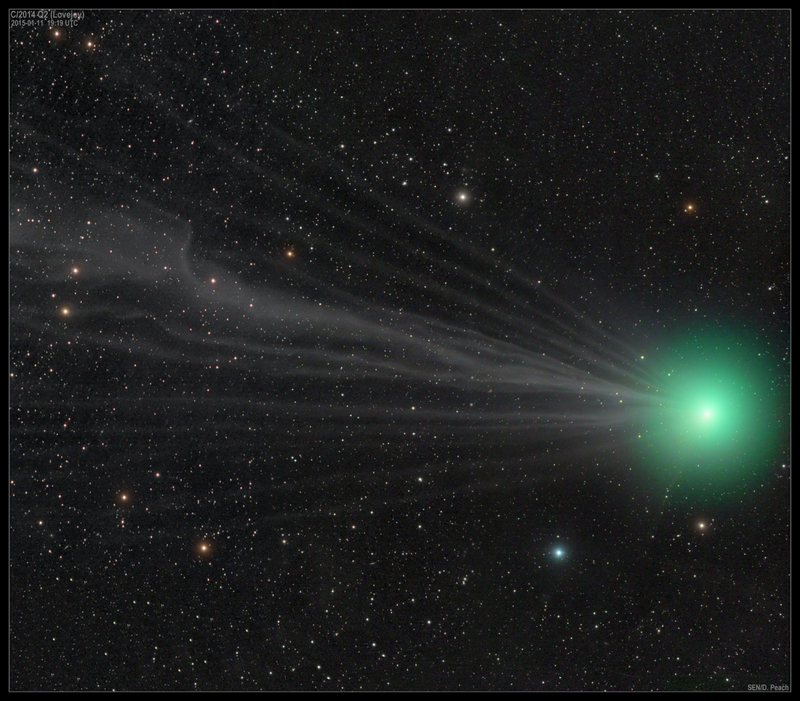 C2014 Q2 Lovejoy on January 13, 2015. Credit and copyright: Shahrin Ahmad. Comet Lovejoy on January 11, 2015. Credit and copyright: Henry Weiland. Wide angle shot of Comet Lovejoy with the constellation Orion, showing rich fields of red nebula, star clouds and dark nebula with the bright green naked eye comet. Credit and copyright: Chris Schur. Comet Lovejoy traveling through Taurus. Imaged on January 12, 2015 from Bathurst, New South Wales. Credit and copyright: Wes Schulstad. C2014 Q2 Lovejoy on January 7, 2015, taken from Bannister Green, England. Credit and copyright: Wendy Clark. Good stuff Nancy! Last Tuesday I finally got my 12 1/2″ mirror back from alum. coating. That night the ‘first light’ I saw was Comet Lovejoy! A great way to start a relationship! I spent the whole evening watching Comet Lovejoy pass a background star. It was really cool seeing motion in a celestial object! Concerning my scope. First light was impressive enough but later when focusing on the Pleiades star cluster, I saw that the star images were not exactly round. I checked the collimation again and found the mirror was out of alignment. I tried adjusting it on the spot, but was unsuccessful in the dark and cold. I spent the whole next day disassembling, modifying and reassembling the mirror’s mount. When I finished, I found the mirror is now dead center and level. Good for the next time I get to test! Then the clouds moved in and today it’s raining. You KNOW I’ll be out there on the next clear night! I hope to get some images and post them as you’ve suggested. Wish me luck? and clear skies! Aqua4U…have you center marked the primary mirror? albone…. f3.4 Actually I haven’t marked the center.. yet and am working toward getting a barlow and laser pointer. First on my bucket list is a new secondary mirror! I made the one (3″ minor dia.) I’m using from an old optical bench plate. It’s worked great for alignment and initial tests but under any magnification it’s obvious the coating is in very poor condition. All of my ‘store bought’ eyepieces are 1 1/4″ dia so I think I’ll go to a 2″ minor axis secondary? Aqua, great! Why couldn’t U.T. request readers to comment and build up a top-10 list of first astro-photos from your new astro-gig? What’s the f/ratio of your system? Real fast, I recall? A Dob or what mount? Motor control and what type of camera setup do you have? Send a link to a photo of your setup. Oh, I wanted to add that every time a prominent comet arrives on the scene that amateurs can photograph, the imagery is a snapshot of the on-going improvements of amateur astro-photography, around the world. Lovejoy is a nice comet but these tech advancements are equally so. Are any of you guys using big dobby reflectors and refractors on the same night? I have found the green/blue colours and the bluish tail feathers easy with my refractor, but not so easy with the reflector (10″ Coulter Odyssey – excellent telescope in all other ways.) This comet has crossed the zenith down here and will now do the same up north – sort of encapsulates the spirit of Christmas! Clear skies. Frazer used to run a weekly star gazing web cast that was a ton of fun when it worked, but suffered from technical snafu’s with the early Google Plus hang out software? Bottom line… The weekly shows were just too much on top of Frazer’s already loaded plate? I suggested that like my old astronomy group, “The Wragg Canyon Star Gazers”, the Hang outs should happen on the weekend nearest the new moon. Basically once a month.. except for those months with “Blue Moon’s”. I’ve been trying to observe Comet Lovejoy from Foxton New Zealand, but the nights have had a cover of thick cloud, even after scorching cloudless days! The images taken round the globe are great and show astronomy is in good heart. I am beginning to see this comet (having had time to think!) as the most gaseous and least dusty I’ve seen. It has so far been docile and well swept! Both tail and coma show only C2 (green, blue) emissions, no white smoky reflections of sunlight any dust would show. It’s too late for the south, but I’m thinking that if in approaching the Sun (perihelion or closest Sun approach is the 29th Jan), the comet opens a vent or vents, even minimal escape of dust could make this still an imager’s dream but give everyone else a special naked eye sight, like Terry’s other Christmas comet of a few years ago.